On July 4, 1856, Georgia Democrats held their state convention in Milledgeville. 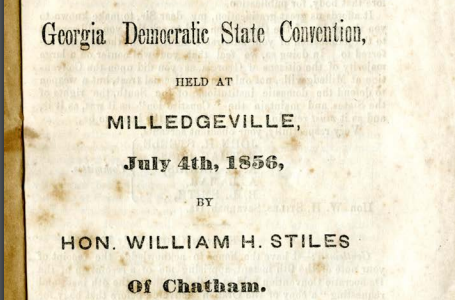 This rare pamphlet has a transcript of the address given by William H. Stiles at the Georgia State Democratic Convention in 1856. An address, delivered before the Georgia Democratic State Convention held at Milledgeville, July 4th, 1856 by William H. Stiles. From the Georgia Historical Society Rare Pamphlet Collection. E435 .S85 1856.